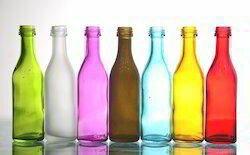 We are offering a wide range of Color Coated Empty Glass Bottles to our clients. Material : Food Grade Non Toxic Material Available Size : 400 ml, 500 ml & 750 ml. We are offering a wide range of horn drinking bottles in efferent color shades, designs and sizes which are made of ethically sourced buffalo horn. These items are elegantly designed at our state-of-the-art manufacturing unit using only high quality of raw materials. Fine Quality Glass Bottles for Gifting, Daily Use. Made with high quality Export Glass. - 8.5 cm *19.0 cm. We are offering our clients Zingo Sipper Bottle. These are a beautiful and perfect sipper for kids. Available in cute colors and fantastic prints on it, these sippers are widely appreciated by our clients. These sippers also consists a flexible straw for providing an easy sip.